NASA's Space Shuttle Crew Compartment Trainer 1 (CCT-1), seen here tilted skyward at the Johnson Space Center in Houston, was delivered to the National Museum of the U.S. Air Force in Dayton, Ohio. 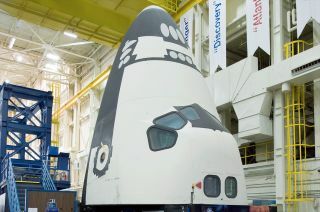 A space shuttle mockup once used to train astronauts, including more than 75 members of the U.S. Air Force, has landed in Ohio, where it is destined for display at the world's largest and oldest military aviation museum. The Space Shuttle Crew Compartment Trainer 1 (CCT-1), which was used for more than three decades at NASA's Johnson Space Center in Houston, was flown onboard the agency's Super Guppy cargo plane to Wright-Patterson Air Force Base in Dayton on Wednesday (Aug. 22). "Today is a great day for the Air Force as we take another step forward in illustrating the rich history of the [U.S.] Air Force's space programs and vital Air Force, NASA and aerospace industry partnerships," Lt. Gen. Jack Hudson, the museum's director, said Wednesday in a statement. "CCT-1 will be a very popular exhibit and provide exciting hands-on educational opportunities for children and adults of all ages." CCT-1, which was used to train the astronaut crews for all but three of NASA's shuttle missions from 1981 to 2011, was one of two orbiter nose section-only trainers that was housed in Johnson Space Center's Space Vehicle Mockup Facility. CCT-2, the twin to CCT-1, will be remaining in the facility to be saved for eventual display by Space Center Houston. The National Museum of the U.S. Air Force had been in the running to receive a space-flown shuttle but ultimately NASA chose institutions in California, Virginia and Florida to display its retired fleet. The space agency gave CCT-1 to the Air Force Museum instead. "I'll always remember the space shuttle as the vehicle that took me to space, but I always say that the second-best thing about going to space is coming back and telling people about it," space shuttle astronaut and Ohio native Michael Foreman said. "Telling the story and sharing the experience with others by adding [CCT-1] to the Air Force museum will allow people to see and understand more of what we experienced." Foreman and his fellow astronauts used CCT-1 to practice on-orbit tasks, train for emergency escapes, and evaluate engineering issues. During 20 classes that were taught by instructors in the trainer, crew members became familiar with the shuttle's many systems. The NMUSAF plans to use CCT-1 similarly, to familiarize the public with the spacecraft that not only flew Air Force pilots to orbit, but also launched with many classified and unclassified payloads and experiments during the space shuttle era. Plans call for the museum to build a full-scale mockup of the shuttle's 60-foot (18.3-meter) payload bay. Concept art of the eventual exhibit depicts wing-shaped walkways and a tail section theater. Instead of crawling through the crew hatch to enter the trainer, the concept art illustrates the back wall of CCT-1 as being removed so visitors can look into the cabin. For now, CCT-1 will be displayed as a standalone exhibit in the museum's Eugene W. Kettering Cold War Gallery surrounded by aircraft, including the only permanent public display of a B-2 stealth bomber. The Air Force museum plans to have the shuttle trainer available for the public to see beginning on Friday (Aug. 24). Next month, NASA specialists working with the museum's curators will repopulate the mockup's interior with the crew seats and other equipment that was removed for the flight aboard the Super Guppy. The Space Gallery, where CCT-1 will eventually reside, is part of a multi-phase, long term expansion plan and will house the museum's growing space collection. In addition to displaying the shuttle mockup, the gallery will include a Titan 4 rocket, Mercury, Gemini and Apollo spacecraft, and many recently retired shuttle artifacts such as a nose cap assembly, a landing gear strut and a variety of shuttle astronaut equipment. The new gallery will also exhibit a range of satellites and related items to showcase the Air Force's reconnaissance, early warning, communications and other space assets. A unique feature of this fourth building will be the creation of interactive spaces for learning in the galleries. Three "Learning Nodes," including one proposed to be at the rear of CCT-1, will host lectures and demonstrations, as well as extensions of the exhibit experience. These 60-seat "gallery classrooms" will allow the museum staff to facilitate new educational experiences, while guest scientists and engineers from Air Force organizations, the aerospace industry, and area colleges and universities will be invited to share their expertise. When these nodes are not in use for scheduled programs, multimedia presentations will be shown to the public.